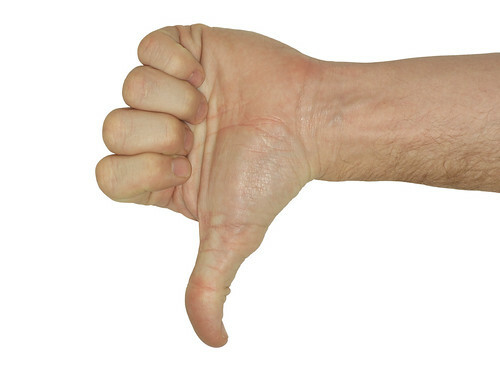 Thumbs Down – With clipping Path, originally uploaded by Craig Jewell. I’ve been asked by a lot of people what I think of Facebook’s new Like button/pages and, as I usually do with Facebook changes, I’ve withheld judgement until I’ve had some time to chew on it. First, there’s the confusion it causes. We already had a Like function in Facebook and it was eminently obvious what it was and how it worked. Previously, when I Liked something in Facebook, it was a declaration of how I felt about that content, or it was a simple “I’m paying attention” notification to the person who published the content, or both. Becoming a Fan, on the other hand, was a lot easier too. You knew what you were getting–primarily updates–when he became a Fan of a page. With Mashable, I get headlines. With brands, I might get coupons. With bands, I get tour information and new videos. But now the calculation I need to make is much more complex. When I like something, is it simply a static page from which I will essentially derive no value? Is it worth it, then, even if I truly like it, to clutter my news feed (and my friends’ news feeds) with content that provides no lasting value simply to declare my affinity to something? Facebook’s missed opportunity, I think, was fashioning the Like button into a new and effortless Digg/Delicious. I would happily Like a lot of stuff if the Like button saved my bookmarks like Delicious but in a in a separate tab, extracted all the relevant tags associated with that content without my input, allowed me to slice and dice my bookmarks the way Delicious does, and RSSified the whole thing. That‘s a product I would use throughout the day like I currently use Delicious. And that’s a product that would eat not just Delicious’ but also Digg’s lunch at the same time because the accumulated Likes would instantly turn the feature into a social news site. But the Like button doesn’t do that. It makes me think more about whether or not I should click. And I don’t think that’s what Facebook was going for.